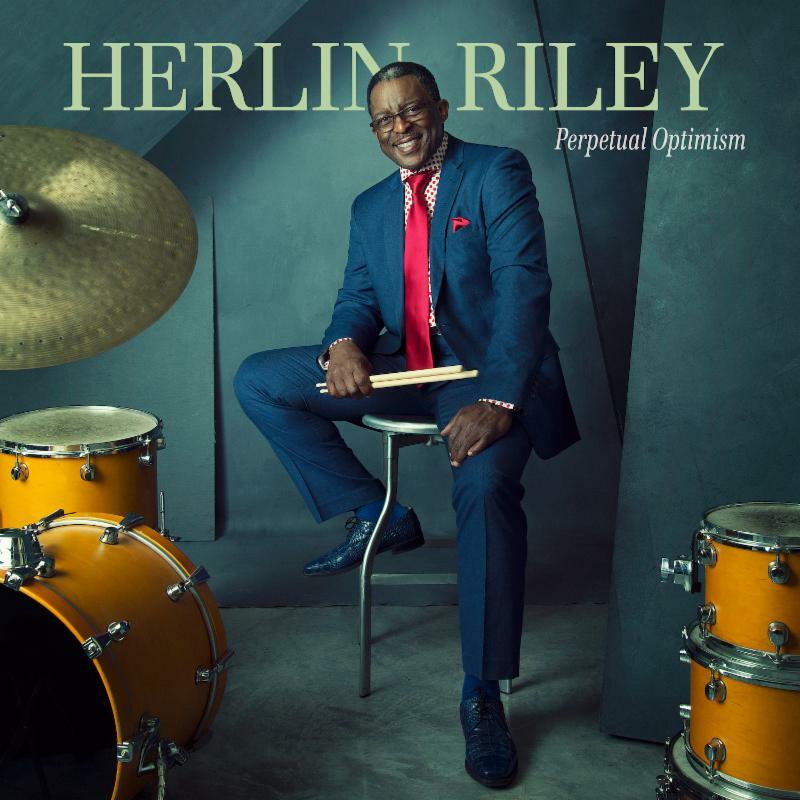 “I want to live in a world where my glass is always half full!” That’s the inspiring maxim of master New Orleans drummer Herlin Riley. On his second Mack Avenue Records release, Perpetual Optimism, the longtime anchor of the Jazz at Lincoln Center Orchestra preaches his silver-lined gospel on 10 tracks whose joyous spirit and contagious swing are sure to convert any listener to the bright side. Due out April 12, Perpetual Optimism reunites the quintet of rising stars that Riley assembled for his Mack Avenue Records debut, New Direction. Since the release of that acclaimed album, all four of Riley’s bandmates – trumpeter Bruce Harris, saxophonist Godwin Louis, pianist Emmet Cohen, and bassist Russell Hall – have been making major waves across the modern jazz scene, attesting to the master drummer’s Art Blakey-like ear for talent and sage musical guidance. Riley’s philosophy of Perpetual Optimism doesn’t mean turning a blind eye to the more distressing aspects of life. The drummer understands that as well as anyone; beyond the standard challenges faced in daily life and the tumultuous times in which we live, he was forced to deal with the loss of both of his parents over the two years since New Direction was released. This album was made against the backdrop of serving as caregiver and then saying farewell to two of the most important people in his life. He also relies on his musical family, including his long-established ties with Wynton Marsalis and the Jazz at Lincoln Center Orchestra. Riley’s connection to the Marsalis dynasty traces back a generation earlier, to family patriarch and fellow lifelong New Orleanian Ellis Marsalis. It was while performing with Ellis at the annual New Orleans Jazz and Heritage Festival in a trio with bassist Reginald Veal that Riley first caught the ear of Wynton, who invited both members of his father’s rhythm section to join him, launching a vital relationship that’s now lasted more than three decades. The same can be said for Riley’s work behind the kit, where he leads his stellar band with infectious enthusiasm and bristling swing. His “Be There When I Get There” captures the anticipation and excitement of rushing to an eagerly awaited appointment, whether a romantic rendezvous, a gathering of friends or a night of music. The brisk “Borders Without Lines” comes from the pen of Riley’s Jazz at Lincoln Center Orchestra bandmate Victor Goines, while the classic “You Don’t Know What Love Is” becomes a sultry simmer, highlighted by Harris’ mournful muted trumpet. The bittersweet “Wings and Roots” looks to the next generation, referring to Riley’s philosophy of raising children: “You have to root them in good values and fundamental characteristics, but once they get to be a certain age you have to give them the wings to be free, to go out and be themselves.” Finally, “Stella By Starlight” is another nod to the American Songbook, taken at a graceful midtempo pace with Cohen’s deft touch over Riley’s sensitive brushwork.